Which books are suitable for my baby? Even if your baby can’t understand the words yet, she’ll enjoy cuddling close and hearing your voice. Babies love to hear a book over and over again. They play with a book as if it were a toy. The important aspect of a story at this time in a baby’s life is the sharing; the joy you can bring to the storytelling moment for your baby is one of the most valuable gifts you can give your child and it will last well into their future. Snuggle up with your baby and a good book and you’ll do more than encourage her interest in reading you’ll also strengthen your emotional bond and stimulate her brain development. “Being read to often helps babies make new and lasting physical connections in their brains,” says Danette Glassy, M.D., a Seattle pediatrician. And research shows that children who are read to do better in school than children who were not exposed to books earlier. We can suggest a multitude of books, songs and rhymes but the best way to show our suggestions is by inviting you into the library where our suggestions array the shelves and feel welcome to join our many programs. We hope to provide you and your child with reading opportunities for many years. As your baby’s awareness grows look for books with simple, brightly coloured pictures and only a few words to each page. Babies who are starting to crawl often like books with simple pictures of things that they know (such as toys, food, cars, animals). As soon as they get old enough to hold books, babies want to turn the pages, tear the pages, chew them and throw them. A baby’s first books need to be strong, simple… and cheap so you won’t worry too much if they get damaged. Where can I find books for my baby? That’s not my… series by Fiona Watt and Rachel Wells will inspire the little reader in every child. Touchy-feely books like these with simple repetitive text are a great way to encourage lots of interaction between parent and child and help very young children develop language and sensory skills. Rod Campbell’s collection of Dear… books should definitely be on your child’s bookshelf! 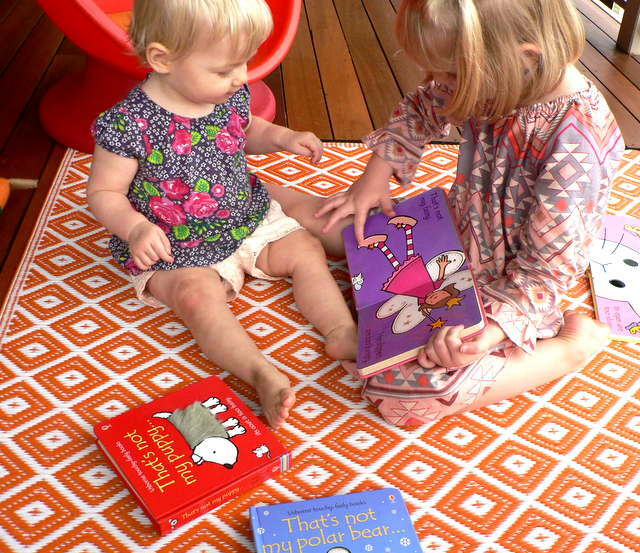 Find heaps of activities here to enhance your child’s reading experience. There is even an app! Touch and feel and flap books are an all time favourite toy for toddlers.